1M enjoyed learning about animals today, with the teachers from Poland! Not sure of what to eat for supper? Year 4 pupils will be creating and cooking pizzas during the next two days as part of our thematic work. The pizzas will on sale at the end of the day for children and parents to purchase. FANTASTIC OPPORTUNITY! Yr 3 – 6 Half term homework! 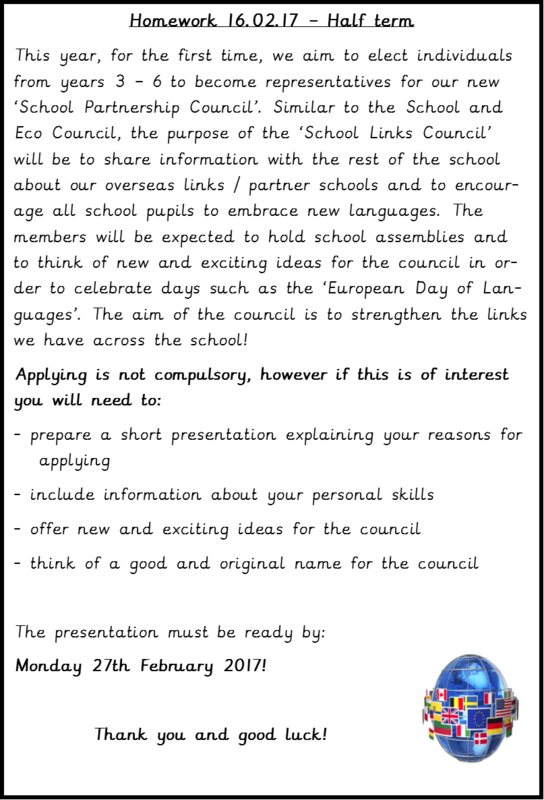 to prepare a presentation to apply to be on the school’s new council (School Links Council) – if they wish to do so! Reception class children enjoying their Chinese New Year march. Reception class enjoying tasting Chinese food.